“The First Exhibition of Works by Members of the London Group” was held in March 1914 at the Goupil Gallery in Lower Regent Street and four months later Britain declared war on Germany. The fledgling group’s timing could not have been better. 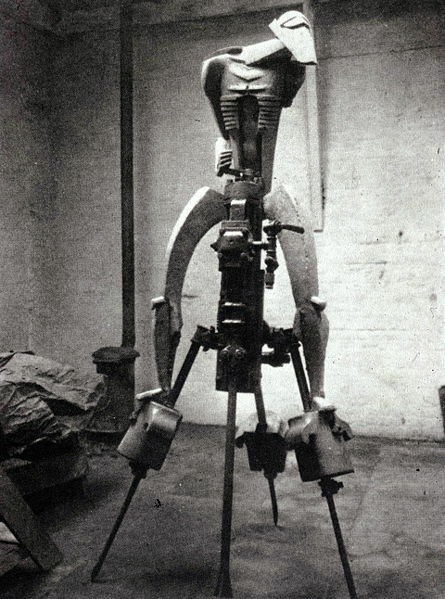 In the second London Group exhibition in March 1915 Jacob Epstein exhibited perhaps the most astonishing and impactful sculpture of early twentieth century British art, “Rock Drill”. Epstein had been making drawings for and constructing “Rock Drill” from 1913. There are reports of visitors to Epstein’s cold, dark, damp garage studio in Lamb’s Conduit Street gasping as he threw back the tarpaulin cover to reveal the creature beneath. Henri Gaudier-Brzeska visited with Ezra Pound, but when Pound began to over-enthuse, Gaudier rounded on him and told him to “shut up, you understand nothing” 1. The white plaster robotic figure straddled a real rock drill sourced from a quarry in Wales, almost a “ready-made”. The sculptor describes his creation, “Here is the armed, sinister figure of today and tomorrow. No Humanity, only the terrible Frankenstein’s monster we have made ourselves into . . .”. 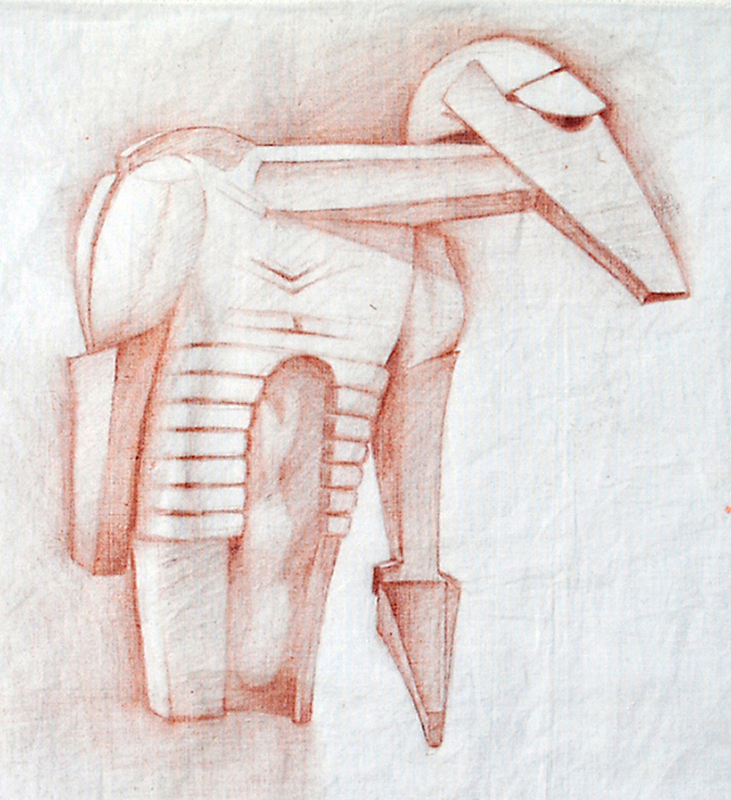 Much has been written about the figure, its symbolism at a time of war (the machine gun like rock drill itself), its gender (the drill is obviously a huge phallus and yet, on close examination, the figure shields a foetus of the species between its ribs) and its roots in native tribal sculpture. Reviewing the 1915 exhibition, The Connoisseur wrote “the works of Mr. Epstein and others of The London Group revealed that the aesthetic tendencies of the most advanced school of modern art are leading us back to the primitive instincts of the savage . . . ”, whilst the Times accused the Group of “Junkerism in Art”, anything bad at this time was blamed on the Germans. Only one sculpture was shown in the London Group’s fourth exhibition in June 1916, Epstein’s “Torso in Metal from the Rock Drill”. Now in the Tate collection, “Torso” is thought by many to reflect Epstein’s revulsion at the maiming and butchery of soldiers in this new and deadly form of mechanised warfare. The white plaster figure straddling the rock drill has lost both legs, one arm and a lower arm, but the foetus remains safe. Having failed to be taken up as a War Artist Epstein enlisted as a Private in the Jewish 38th Battalion of the Royal Fusiliers in 1917. At some point in his army travels he passed the spot where his London Group sculptor friend and colleague Henri Gaudier-Brzeska had been killed by a machine gun bullet through the forehead leading a charge of French Cavalry in 1915. “The ground was covered with snow, nobody about, and my god, it did look a cheerless place to die”. Epstein was also deeply traumatised by the loss of T.E. Hulme in September 1917, blown up by a German shell in Flanders. Hume had been writing a book about Epstein’s sculpture, “which he had with him in manuscript, disappeared from his effects, and has never turned up”2. London Group founder member (for the time being) Wyndham Lewis, despite having a spat with Epstein, admired his “Rock Drill”. Lewis became an officer in the Royal Garrison Artillery in March 1916, “serving in direct contact with some of the most scientific and destructive weaponry of the war”3, totally appropriate for the editor of BLAST and leader of the Vorticists! 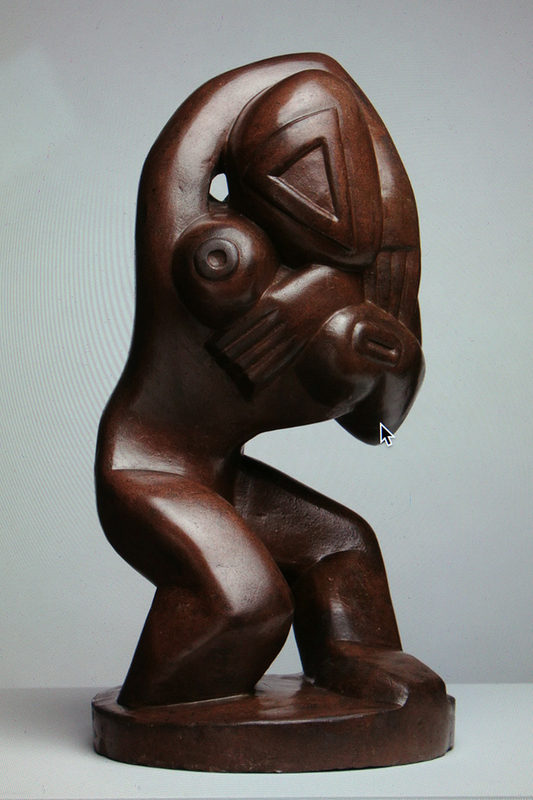 Had Gaudier-Brzeska survived the war and continued his London Group associations with Jacob Epstein, and had T.E. Hulme also survived, the development of early twentieth century British sculpture would surely have been fruitful and dynamic in their capable hands. Witness the promise in “Red Stone Dancer” c. 1913 shown in the first London Group exhibition of 1914 and now also in the Tate collection. Gaudier-Brzeska was the only London Group member killed in the First World War. For those, and there were many, who were invalided out of action due to wounds, gassing or mental breakdown, there was often a return to the front line, but this time as Official War Artists.